In 2014, REGDOC-2.12.3, Security of Nuclear Substances: Sealed Sources, was introduced to augment the security of sealed sources under the Nuclear Safety and Control Act (NSCA). The new requirements as set out in REGDOC-2.12.3 were implemented in 2015 for category 1 and 2 radioactive sources. The remaining categories (3–5) will be implemented in 2018. These augmented requirements are now a condition of Class II licences authorizing the use of sealed sources. Below are the most commonly cited non-compliances by CNSC inspectors, based on the requirements set out in REGDOC-2.12.3. Consistent and regular review of physical barriers is required to ensure barriers cannot be compromised. Guidance on implementing effective barriers can be found under additional resources. Licensees are encouraged to regularly review and update their security programs to ensure effectiveness and efficiency. When submitting new or updated security-related information to the CNSC, ensure it is properly protected. For questions or concerns, contact your project officer. All licensees who operate Class II nuclear facilities or who service Class II prescribed equipment are required to appoint a certified radiation safety officer (RSO), in accordance with the Nuclear Safety and Control Act (NSCA) and its regulations. The RSO certification exam is tailored to the licensed activities and prescribed equipment at your facility. The intent of the examination is to assess whether you are “capable of performing the duties of the position” as per paragraph 15.04(1)(b) of the Class II Nuclear Facilities and Prescribed Equipment Regulations. The exam is conducted online and consists of a combination of multiple choice and short answer questions. The exam is open book and candidates may consult appropriate references as required. Since certification of RSOs started in 2010, 22 candidates have failed the certification exam. Of these 22 candidates, 41% were requesting certification for a medical facility, 32 for a commercial third-party service company and 27% for an industrial facility. Following the exam, areas of weakness were identified by the examiner for each candidate. These have been examined globally to determine which topic areas give the most difficulty. 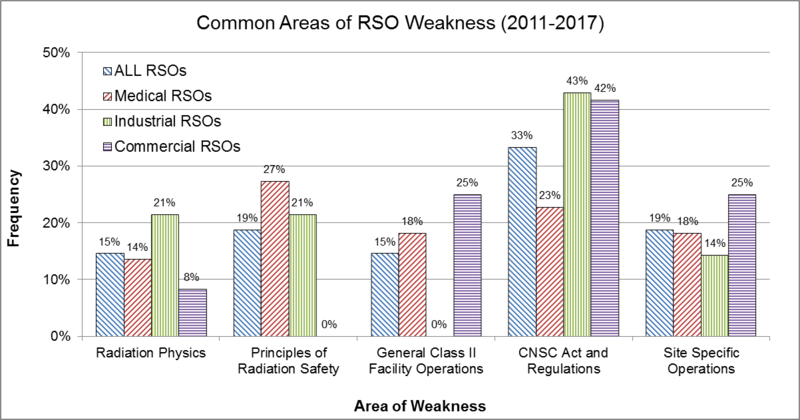 Figure 1 illustrates the percentage of the RSO applicants with weakness(es) identified in the five areas of knowledge, as indicated by the examiner. Overall, the most common area of weakness shared among all candidates was knowledge of the CNSC Act and Regulations. Another common weakness was related to the ability of the candidate to communicate their understanding of concepts, such as explaining the purpose of their radiation safety program and providing examples, as opposed to stating definitions or reading aloud the relevant regulations. To better prepare for the RSO certification exam, candidates are encouraged to review any resources that might be useful in covering these topics, including their site-specific radiation safety program. Candidates must also be able to explain how their program aligns with the principles of radiation safety. In addition, a review of the NSCA and the relevant regulations, available on the CNSC website, is suggested. When the CNSC performs an inspection at a facility, its inspectors assess the licensee's program against the applicable regulations and the licence conditions that appear in their licence. Any deficiencies that are noted are cited as non-compliances against the applicable regulation or licence condition. The frequency and types of non-compliances change as regulatory focus shifts or as different technologies are adopted. Regardless of these changes, inspectors have noted the most common non-compliances that occur from year to year. Figure 2 shows the top 10 cited regulations for Class II nuclear facilities between 2014 and 2016 and table 1 indicates what action would result in a non-compliance against each of these regulations. The frequency is represented by the percentage of inspections in which each regulation was cited at least once. It is possible for more than one non-compliance to be cited against the same regulation. However, for the purposes of figure 2, these were counted only once. It is clear from figure 2 that in many cases the same regulations are consistently cited from year to year. Each licensee that operates a Class II nuclear facility is required to have a radiation protection program. The radiation protection program ensures that contamination levels and radiation doses received by workers are monitored, controlled and maintained below regulatory dose limits, and kept at levels that are as low as reasonably achievable (ALARA). Licensees are expected to monitor worker doses and to designate as a nuclear energy worker (NEW) anyone who is likely to receive more than 1 millisievert (mSv) per year in the course of their work. A total of 6,368 workers at Class II facilities had their occupational doses monitored in 2015. Of these, 4,978 workers were designated as NEWs. There are four main sectors in which Class II facilities can be categorized, the breakdown of which is given in figure 3. Additional information relating to expectations for security while in transport was published in the Spring 2018 issue of the DNSR newsletter. November 2017 – Tritium Information Bulletin – contains information regarding tritium levels in enriched water. March 2017 – Radionuclide Information Booklet – contains information pages for radionuclides commonly used in the medical, research and industrial sectors.